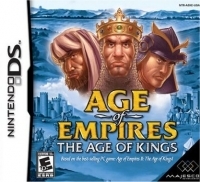 Box Text: Take command of a classic army and defeat your enemies in the deepest battle strategy game on the Nintendo DS. Dominance of the known world is literally at your fingertips. *Command 1 of 5 different civilizations: Britons, Franks, Mongols, Saracens & Japanese. *Take control of 'Hero' units like Richard the Lionhearted, Joan of Arc & Genghis Khan. *Turn-based strategy system. *Command over 65+ different types of units. *4-player combat scenarios. 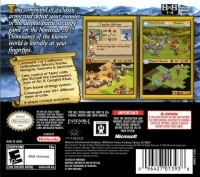 09-09-2011 desocietas Box Text Take command of a classic army and defeat your enemies in the deepest battle strategy game on the Nintendo DS. Dominance of the known world is literally at your fingertips. *Command 1 of 5 different civilizations: Britons, Franks, Mongols, Saracens & Japanese. *Take control of 'Hero' units like Richard the Lionhearted, Joan of Arc & Genghis Khan. *Turn-based strategy system. *Command over 65+ different types of units. *4-player combat scenarios. 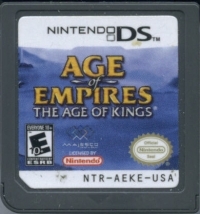 This is a list of VGCollect users who have Age of Empires: The Age of Kings in their Collection. This is a list of VGCollect users who have Age of Empires: The Age of Kings in their Sell List. This is a list of VGCollect users who have Age of Empires: The Age of Kings in their Wish List.